A pink coloration can be seen on this reindeer's nose. Ho ho ho, here's some Christmas-themed science! The British Medical Journal's Christmas issue this month features a study about reindeer that treats a fantastical idea with some medical reality. The result is a lesson in how reindeer noses compare to the noses of humans and what purpose their underlying structures serve. Can Ince, a professor who works in intensive care medicine at Erasmus Medical Center in the Netherlands, studies microcirculation, or how the smallest blood vessels in the body receive blood. Red blood cells go to these vessels to relieve themselves of oxygen, delivering it to the tissues that need it. Ince and colleagues developed a hand microscope so that doctors can look for abnormalities and pathologies in the smallest blood vessels, even when blood pressure is normalized. This has had a great influence on intensive care medicine, Ince said. Particularly interesting to Ince was how this might apply to the nasal tract and, more generally, to ear, nose and throat diseases. "We decided to study the best known nose in the business, which was, of course, Rudolph’s nose," Ince said. The new study looked at both humans and reindeer. Five healthy human volunteers, two adult reindeer, and a patient with a condition called nasal polyposis participated. The researchers saw that the patients with nasal polyposis had abnormal microvasculature, or blood vessels in their noses. To check out the reindeer noses, Ince traveled to Tromso, Norway, where researchers there study how reindeer and other animals adapt to their environment. It is indeed relatively near the North Pole; in fact, the University of Tromso, where one of the researchers is based, is the world's northernmost university, according to its website. These reindeer are subjected to some fairly frosty temperatures in the wild, as low as around -40 degrees F. But they still need a way to cool off vital organs. Researchers put reindeer on a treadmill to see what happens to their internal temperature when they're running. 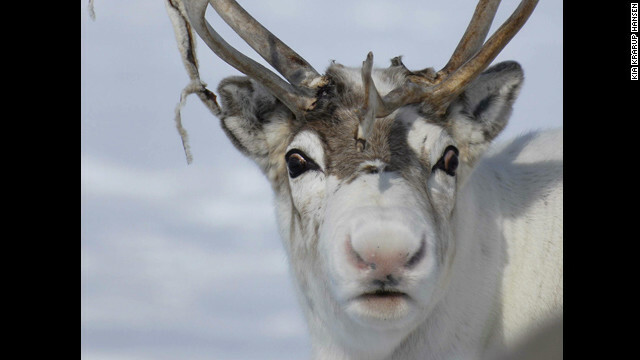 The nose of the reindeer plays an important role in regulating the animal's brain temperature, Ince said. The nose ventilates the brain with the blood in the microcirculation, Ince said. In the new study, researchers saw that when viewed in infrared light (with a thermal camera), reindeer noses do glow red. And in normal light, reindeer can have a pink coloration on their noses. "We found that Rudolph, indeed, has a red nose, but that it is completely related to his normal physiology," Ince said. The blood vessels in the reindeer appear to fill and empty in a rhythmic flow, which had never been observed before, Ince said. He believes the images in the study are the first of nasal microcirculation in reindeer. Reindeer have more small vessels, and 25% higher density of these vessels, in their noses than humans do, the scientists said. But they seem to have similarities in terms of small structures within the nose. These structures that produce a lot of the mucus in the nose are important because they help with the humidification of our bodies. If our noses didn't have hairs, we would dry out very rapidly, Ince said. Learn more about the study in this video from the British Medical Journal. 2.25 here. I had to reply..
What a sweet animal (in the video)! I'm relieved to learn that they are trained to accept the treadmill without suffering stress. My political party never said they were red. Only Rudolph's. So, it's a lie by our opponents. This is what happens when some kid writes to Santa wanting "SIANCE STUF". Don't leave out all the other gods that were born on Dec 25th: Krishna, Mithra, Helios, Sol, Attis, Horus, Dionysus, Tammuz, Odin, Bedru, Adad, Crite, Salivahana, Hermes, Bacchus, Prometheus, Hercules, Nimrod, Jupiter, Quetzalcoatl. About one of every 365 Jesus has his birthday on December 25. They all wonder what gift you are talking about and where they can pick it up. Ignobelworthy... At least Mr Ince got his free skip trip. Great story, especially in light of the holiday! My nose really is red. Some even say it glows. All of the other reindeer used to laugh and call me names. They never let poor me play in any reindeer games. Then one snowy Christmas eve, Santa came to say, Rudolph with your nose so bright, won't you guide my sleigh tonight? That's when I told him to shove his job up his you-know-what. Because I'm a union guy. And you can't tell me what to do. Thanks, Mitt. Sorry about that election thing. LOL. Love it. Go unions and fair wages for all! I am so playing reindeer games this Christmas. Cheers. Elizabeth Landau, please never type out an article again. Thanks. About twenty years ago when Santa and the Reindeers started to catch on in China, at a local hotel in Beijing the Red Nose was on Santa! It was a good and probably logical theory when faced with one Red Nose in the kit box with no instructions. That was a Ho Ho Ho moment for me. Happy Holidays. but can they fly though?